I live in NASA territory, working with NASA historical records. So it will be an understatement when I say that there is no escaping the immense significance of today in our country's history. July 20, 1969. 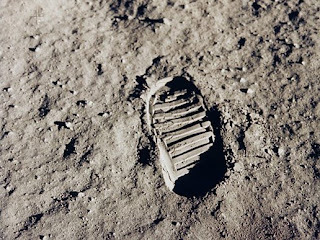 Men from our planet Earth walked on the moon. For how many millions of years has man looked to the stars... to the heavens... and wondered how God sees us. We choose to go to the moon in this decade....not because they are easy, but because they are hard. When President Kennedy said these words in September 1962, NASA had sent only four men into space. Al Shepard & Gus Grissom had each taken a 15 minute up/down flight. John Glenn had orbited the earth three times taking just under five hours with Scott Carpenter duplicating the flight a few months later. Imagine if one of the Wright Brothers had stood on the sands at Kitty Hawk and said, I think we should fly across the Atlantic Ocean before the end of this decade. But we never paused long enough to doubt we could do it. We persevered. I wonder if our country would have followed through with this ambitious mission if President Kennedy hadn't been assassinated, or if the Soviet Union had not launched Sputnik, starting the Space Race in the midst of a Cold War. Probably not. NASA needed over 400,000 men and women to work together with zero defects to achieve this dream. They had to develop new technology, write programs, create standards, think through thousands of challenges: radiation, re-entry, landing, rendezvous, life support, space suits, back contamination, propulsion, navigation, and communications. And I have more technology in my iPod Touch than they had on the entire spacecraft. Through all of their challenges they never lost sight of their goal. Forty years ago today Neil Armstrong and Edwin "Buzz" Aldrin landed on the moon with Michael Collins in lunar orbit above. God doesn't give us DREAMS to disappoint us. God gives us unlimited abilities. We place the boundaries on ourselves. 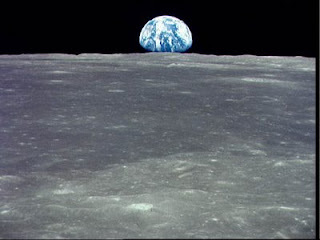 I pray our country sheds those boundaries and we return to the moon, and then set our sights on Mars, and beyond. "I stood on God's porch." Both clips give me chills. Especially the Apollo Landing clip. Shely, you have been so fortunate to work at 2 jobs during auspicious anniversaries - the 40th anniversary of the Moon Landing and the 100 year anniversary of the 1900 Galveston Storm.